The Foreign Intelligence Service of the Russian Federation (Russian: Слу́жба вне́шней разве́дки Российской Федерации, tr. Sluzhba vneshney razvedki Rossiyskoy Federatsii, IPA: [ˈsluʐbə ˈvnʲɛʂnʲɪj rɐˈzvʲɛtkʲɪ]) or SVR RF (Russian: СВР РФ) is Russia's external intelligence agency, focusing mainly on civilian affairs. The SVR RF succeeded the First Chief Directorate (PGU) of the KGB in December 1991. The SVR has its headquarters in the Yasenevo District of Moscow. 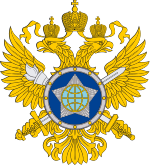 Unlike the Russian Federal Security Service (FSB), the SVR is tasked with intelligence and espionage activities outside the Russian Federation. It works together with the Russian Main Intelligence Directorate (Russian: Гла́вное разве́дывательное управле́ние, tr. Glavnoye razvedyvatel'noye upravleniye, IPA: [ˈglavnəjə rɐzˈvʲɛdɨvətʲɪlʲnəjə ʊprɐˈvlʲenʲɪjə], GRU), its military-affairs espionage counterpart, which reportedly deployed six times as many spies in foreign countries as the SVR in 1997. The SVR is also authorized to negotiate anti-terrorist cooperation and intelligence-sharing arrangements with foreign intelligence agencies, and provides analysis and dissemination of intelligence to the Russian president. Any information pertaining to specific identities of staff employees (officers) of the SVR is legally classified as a state secret; since September 2018, the same applies to non-staff personnel, i.e. informers and recruited agents. SVR RF is the official foreign-operations successor to many prior Soviet-era foreign intelligence agencies, ranging from the original 'foreign department' of the Cheka under Vladimir Lenin, to the OGPU and NKVD of the Stalinist era, followed by the First Chief Directorate of the KGB. Officially, the SVR RF dates its own beginnings to the founding of the Special Section of the Cheka on 20 December 1920. The head of the Cheka, Felix Dzerzhinsky, created the Foreign Department (Inostranny Otdel – INO) to improve the collection as well as the dissemination of foreign intelligence. On 6 February 1922, the Foreign Department of the Cheka became part of a renamed organization, the State Political Directorate, or GPU. The Foreign Department was placed in charge of intelligence activities overseas, including collection of important intelligence from foreign countries and the liquidation of defectors, emigres, and other assorted 'enemies of the people'. In 1922, after the creation of the State Political Directorate (GPU) and its merger with the People's Commissariat for Internal Affairs of the RSFSR, foreign intelligence was conducted by the GPU Foreign Department, and between December 1923 and July 1934 by the Foreign Department of Joint State Political Administration or OGPU. In July 1934, the OGPU was reincorporated into the NKVD. In 1954, the NKVD in turn became the KGB, which in 1991 became SVR and FSB. In 1996, the SVR RF issued a CD-ROM entitled Russian Foreign Intelligence: VChK–KGB–SVR, which claims to provide "a professional view on the history and development of one of the most powerful secret services in the world" where all services are presented as one evolving organization. Former Director of the SVR RF Sergei Lebedev stated “there has not been any place on the planet where a KGB officer has not been.” During their 80th anniversary celebration, Vladimir Putin went to SVR headquarters to meet with other former KGB/SVR chiefs Vladimir Kryuchkov, Leonid Shebarshin, Yevgeny Primakov and Vyacheslav Trubnikov, as well as other famous agents, including the British double agent and ex-Soviet spy George Blake. The "Law on Foreign Intelligence" was written by the SVR leadership itself and adopted in August 1992. This Law provided conditions for "penetration by checkists of all levels of the government and economy", since it stipulated that "career personnel may occupy positions in ministries, departments, establishments, enterprises and organizations in accordance with the requirements of this law without compromising their association with foreign intelligence agencies." Conduct electronic surveillance in foreign countries. The President of the Russian Federation (currently Vladimir Putin) can personally issue any secret orders to the SVR RF without consulting the houses of the Federal Assembly: State Duma and Federation Council. According to Article 12 of the 1996 Federal Law "On Foreign Intelligence", "overall direction" of external intelligence activity is executed by the president of Russia, who appoints Director of the SVR. The Director provides regular briefings to the president. The Director is a permanent member of the Security Council of Russia and the Defense Council. Directorate S: Illegal Intelligence: Included thirteen departments responsible for preparing and planting "illegal agents" abroad, "biological espionage", recruitment of foreign citizens on the Russian territory and other duties. Directorate KR: External Counter-Intelligence: This Directorate "carries out infiltration of foreign intelligence and security services and exercises surveillance over Russian citizens abroad." Directorate R: Operational Planning and Analysis: Evaluates SVR operations abroad. Directorate I: Computer Service (Information and Dissemination): Analyzes and distributes intelligence data and publishes a daily current events summaries for the President. Each Directorate is headed by a Deputy Director who reports to the SVR Director. The Red Banner Intelligence Academy has been renamed the Academy of Foreign Intelligence (ABP are its Russian initials) and is housed in the Science Directorate. Within the Operations Department of Directorate S, there is the elite Special Operations (Spetsnaz) Group called Zaslon [ru]. Formerly in PGU KGB USSR called Vympel (e.g. French counterpart; Division Action). However, mere existence of such group within the SVR is denied by Russian authorities. Nevertheless, there were some rumours that such a group does indeed exist and is assigned to execute very special operations abroad primarily for protection of Russian embassy personnel and internal investigations. It is believed that the group is deep undercover and consists of approximately 500 highly experienced operatives speaking several languages and having extensive record of operations while serving in other secret units of the Russian military. During Boris Yeltsin's presidency, the SVR conflicted with Russian Ministry of Foreign Affairs for directing Russian foreign policy. SVR director Yevgeni Primakov upstaged the foreign ministry by publishing warnings to the West not to interfere in the unification of Russia with other former Soviet republics and attacking the NATO extension as a threat to Russian security, whereas foreign minister Andrey Kozyrev was requesting different things. The rivalry ended in decisive victory for the SVR, when Primakov replaced Kozyrev in January 1996 and brought with him a number of SVR officers to the foreign ministry of Russia. In September 1999, Yeltsin admitted that the SVR plays a greater role in the Russian foreign policy than the Foreign Ministry. It was reported that the SVR defined the Russian position on the transfer of nuclear technologies to Iran, NATO expansion, and modification of the Anti-Ballistic Missile Treaty. the SVR also tried to justify annexation of the Baltic states by the Soviet Union in World War II using selectively declassified documents. The SVR sends to the Russian president daily digests of intelligence, similar to the President's Daily Brief produced by the United States Intelligence Community in the US. However, unlike in the US, the SVR recommends to the president which policy options are preferable. According to former GRU Colonel Stanislav Lunev, "The SVR and GRU (Russia's political and military intelligence agencies, respectively) are operating against the U.S. in a much more active manner than they were during even the hottest days of the Cold War." From the end of the 1980s, KGB and later SVR began to create "a second echelon" of "auxiliary agents in addition to our main weapons, illegals and special agents", according to former SVR officer Kouzminov. These agents are legal immigrants, including scientists and other professionals. Another SVR officer who defected to Britain in 1996 described several thousand Russian agents and intelligence officers, some of them "illegals" who live under deep cover abroad. Between 1994 and 2001, Russian high-profile agents caught in the US included Aldrich Hazen Ames, Harold James Nicholson, Earl Edwin Pitts, Robert Philip Hanssen and George Trofimoff. An agreement on intelligence cooperation between Russia and China was signed in 1992. This secret treaty covers cooperation of the GRU GSh VS RF and the SVR RF with the Chinese People's Liberation Army's Military Intelligence Directorate. In 2003 it was reported that SVR RF trained Iraqi spies when Russia collaborated with Saddam Hussein. The SVR also has cooperation agreements with the secret police services of certain former Soviet republics, such as Azerbaijan and Belarus. "In the Soviet era, the SVR – then part of the KGB – handled covert political assassinations abroad". These activities reportedly continue. Igor the Assassin, who is believed to have been the poisoner of Alexander Litvinenko in 2006, was allegedly an SVR officer. However, SVR denied involvement in the poisoning of Alexander Litvinenko. An SVR spokesperson queried over Litvinenko remarked: "May God give him health." It was reported in September 2003 that an SVR RF agent in London was making preparations to assassinate Boris Berezovsky with a binary weapon, and that is why Berezovsky had been speedily granted asylum in Britain. GRU officers who killed Zelimkhan Yandarbiyev in Qatar in 2004 reportedly claimed that supporting SVR agents let them down by not evacuating them in time, so they have been arrested by Qatar authorities. According to senior SVR officer Sergei Tretyakov, he often sent intelligence officers to branches of the New York Public Library where they got access to the Internet without anyone knowing their identity. They placed propaganda and disinformation to educational web sites and sent e-mails to US broadcasters. The articles or studies were generated by Russian experts who worked for the SVR. The purpose of these active measures was to whitewash Russian foreign policy, to create a good image of Russia, to promote Anti-American feelings and "to cause dissension and unrest inside the US". The SVR RF actively recruits Russian citizens who live in foreign countries. "Once the SVR officer targets a Russian émigré for recruitment, they approach them, usually at their place of residence and make an effort to reach an understanding," said former FSB officer Aleksander Litvinenko. "If he or she refuses, the intelligence officer then threatens the would-be recruit with legal prosecution in Russia, and if the person continues to refuse, the charges are fabricated". It was reported that the SVR prey on successful Russian businessmen abroad and a close number of foreigners swearing allegiance upon pain of death. These claims have not been confirmed by the official SVR website, which states that only Russian citizens without dual citizenship can become SVR RF agents. Today, Russian intelligence can no longer recruit people on the basis of Communist ideals, which was the "first pillar" of KGB recruitment, said analyst Konstantin Preobrazhenskiy. "The second pillar of recruitment is love for Russia. In the West, only Russian immigrants have feelings of filial obedience toward Russia. That’s precisely why [the SVR] works with them so often. A special division was created just for this purpose. It regularly holds Russian immigrant conferences, which Putin is fond of attending." February 1994: Aldrich Hazen Ames was charged with providing highly classified information since 1985 to the Soviet Union and then Russia. The information he passed led to the execution of at least 9 United States agents in Russia. In April, he and his wife pleaded guilty to conspiring to commit espionage and to evading taxes. He was sentenced to life in prison without parole. November 1996: Harold James Nicholson was arrested while attempting to take top secret documents out of the United States. He began spying for Russia in 1994. He was a senior-ranking Central Intelligence Agency officer. In 1997, he pleaded guilty and was sentenced to more than 23 years in prison. December 1996: Earl Edwin Pitts was charged with providing top secret documents to the Soviet Union and then Russia from 1987 until 1992. In 1997, he pleaded guilty to two counts of espionage and was sentenced to 27 years in prison. June 2000: George Trofimoff, a naturalized US citizen of Russian parents, was arrested for spying for the Soviet Union and Russia since about 1969. Having retired as a colonel in the United States Army Reserve, he was the highest-ranking military officer ever accused of spying. He was convicted and sentenced to life imprisonment. October 2000: Sergei Tretyakov, an SVR officer working undercover at the Russian UN mission defected to the United States with his family. February 2001: Robert Philip Hanssen was arrested for spying for the Soviet Union and Russia for more than 15 years of his 27 years with the Federal Bureau of Investigation. He passed thousands of pages of classified documents on nuclear war defenses and Sensitive Compartmented Information and exposed three Russian agents of the United States, two of whom were tried and executed. He pleaded guilty to espionage and was sentenced to life in prison. June 2010: With the breakup of known parts of the Illegals Program, 10 individuals who allegedly carried on deep-cover espionage activities were arrested by FBI, and an eleventh was arrested while attempting to transit through Cyprus. These individuals were purportedly working for the SVR on long term covert assignments in penetrating policy making circles in the United States government. An agent going by the name of Christopher Metsos is still being sought by the authorities; the agents arrested on 28 June 2010 include Mikhail Semenko, Vladimir Guryev, Lidiya Guryev, Andrey Bezrukov, Yelena Vavilova, Mikhail Kutsik, Nataliya Pereverzeva, Mikhail Anatolyevich Vasenkov, Vicky Pelaez, and Anna Chapman. A twelfth man, Alexey Karetnikov, was deported later. They were revealed by SVR defector Deputy Head of illegal spies, colonel Alexander Poteyev [ru]. ^ a b c d The Security Organs of the Russian Federation: A Brief History 1991–2004 by Jonathan Littell, Psan Publishing House 2006. ^ a b c d e Vasili Mitrokhin and Christopher Andrew (2000). The Mitrokhin Archive: The KGB in Europe and the West. Gardners Books. ISBN 0-14-028487-7. ^ Путин засекретил и сделал гостайной данные о всех "внештатниках" Службы внешней разведки (СВР) NEWSru 4 September 2018. ^ National Counterintelligence and Security Center. Rafalko, Frank J., ed. A Counterintelligence Reader, Volume IV: American Revolution Into the New Millenium (PDF). National Counterintelligence and Security Center. ISBN 9781780392318 – via Federation of American Scientists. ^ "SVR Organization - Russia / Soviet Intelligence Agencies". Retrieved 16 May 2016. ^ a b Alexander Kouzminov, Biological Espionage: Special Operations of the Soviet and Russian Foreign Intelligence Services in the West, Greenhill Books, 2006, ISBN 1-85367-646-2. ^ "Служба внешней разведки Российской Федерации". Retrieved 16 May 2016. ^ Sputnik (23 November 2006). "Russian intelligence justifies Soviet annexation of Baltic states". Retrieved 16 May 2016. ^ a b "PDF volume about SVR espionage activities" (PDF). Office of the Director of National Intelligence. Archived from the original (PDF) on 10 July 2007. ^ Robert Collier; Bill Wallace (April 17, 2003). "Russia now admits training Iraqi spies / But it says intent was to fight crime, terror". San Francisco Chronicle. Retrieved 21 February 2014. ^ "Iraq's Russian Arms Buyer Headed Germ Warfare Program; Russian Spies Unmasked in London Financial System". AFPC.org. Archived from the original on 7 June 2007. ^ a b "Defence & Security Intelligence & Analysis - IHS Jane's 360". Retrieved 16 May 2016. ^ a b c d e Defense Personnel Security Research Center. "Espionage Cases 1975–2004". Retrieved 19 February 2006. ^ McGreal, Chris (29 June 2010). "FBI breaks up Russian spy ring in deep cover". The Guardian. UK. ^ "U.S. arrests 10 for allegedly spying for Russia". Reuters News Service. 28 June 2010. ^ Shane, Scott; Savage, Charlie (28 June 2010). "US Charges 11 With Acting as Agents for Russia". New York Times. ^ "Cambridge couple linked to alleged Russian spy network". Boston Globe. 28 June 2010. ^ "Who were the alleged spies working for". CBS news. 28 June 2010.